The old masters always mentioned the eyes of Alloces. They saw them as red, fierce and full of fire. "Those who look directly into his eyes see their own death," said the Seagate writer. So what is there about Alloces that the magicians found so alarming? One new art drawing shows the spirit as only an upper torso of a human skeleton, wearing war armor, and with fire in the eye sockets of the skull. Not only that, but the skull hovers over the Earth, far below. Like so many of the other Goetia Spirits, Alloces chooses to portray himself as a dead man. He wasn't always skull and bones to the magicians of old. Collin de Plancy said Alloces "dresses as a knight and rides a horse. His face is characteristic of a lion, with an inflamed complexion and fervent eyes." Johann Wier wrote that "Allocer he commeth foorth like a soldier, riding on a great horsse, he hath a lions face, verie red, and with flaming eies, he speaketh with a big voice (sic)." 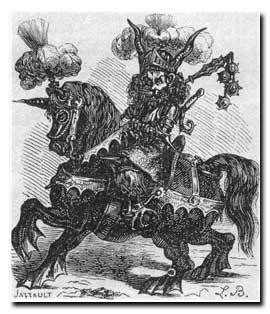 He wrote that this demon is often mounted on a large horse with dragon legs. He has a ruddy complexion and speaks with much gravity. The fifty-second Goetia Spirit, Alloces holds the rank of duke with 36 legions of demons under his command. He is said to induce people to immorality and he teaches arts and the mysteries of the sky. Allocer was said to have once taught astronomy and the liberal sciences.